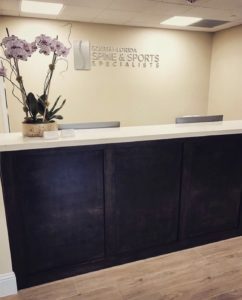 The South Florida Spine & Sports Specialists are a group of physicians and team members that pride themselves on understanding the patient as a whole. We are a comprehensive spine and sports medicine practice with dedicated board-certified and fellowship trained specialists, treating all painful musculoskeletal, neurologic, and spinal conditions in our brand-new state-of-the-art facility located conveniently along the I-75 corridor in Miramar, Florida. We offer the latest precision diagnostic and treatment options to maximize recovery in our office with over 3,000 square feet of patient friendly exam rooms, physical therapy, digital X-Ray, EMG, musculoskeletal ultrasound, in-house procedure room, and electronic medical records. We have over twenty years combined experience in providing the care and treatment you deserve. Our goal and focus is to offer the very best service and medical care available as we guide our patients on a path of rehabilitation, mobility, and function.